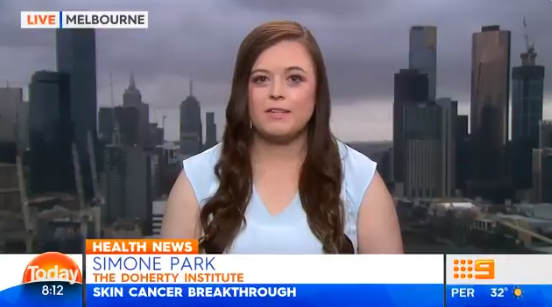 The new Nature paper was a collaborative effort between researchers from the Doherty Institute and Telethon Kids Institute. TRM cells were able to control the tumour in the mice for the life of the animal, which is likely to equate to decades of protection in humans. Simone created an imaging model to study TRM cells and melanoma in a mouse model. "Using a special microscope, we could see individual melanoma cells sitting in the skin of the mouse, and could watch the T cells move through the skin, find the melanoma cells and control the growth of those cells," Simone explained. One of the main issues for cancer patients is that there is always a risk that the tumour can come back years later, after surgery or chemotherapy. Previous research has shown that small numbers of cancer cells persist in the body after treatment and that the immune system probably keeps the cancer cells under control but this study in mice could study the immune system directly. This is work that could never be done in people. "I was able to see through moving images that these TRM cells are important for maintaining the control of the tumour cells; if you remove the TRM cells you have a break in that control and the cancer can start to grow back again," Simone said. "If you could make more of these TRM cells through immunotherapies, or enhance the activity of those that are already there in some way, you could boost anti-tumour immunity." Senior author on the paper, Associate Professor Gebhardt, said an increase of TRM cells has already been associated with better outcomes in cancer patients, but the way they work to suppress tumours has remained unknown. Associate Professor Gebhardt said: "The principal of cutting-edge immunotherapies currently in clinical practise is that they generate a T-cell response. But if we can hone in on one type of T-cell – the TRM cells specifically, we could have an even bigger impact on stopping cancers from coming back." "We now have a much better understanding of which T-cells are important in controlling skin cancers and how these cells are working but there is still much more work to do to make these cells work even better." Simone was interviewed live on Weekend Today (Channel 9) and Xinhua News Agency about the research. Organised in collaboration with the Telethon Kids Institute, Channel 7 in Perth also ran a story on this study.